Riding on a successful public offering, Splunk (s splk) is doing well for itself as it manages logs and other machine data for companies, to the tune of $198 million in annual net sales. It now looks like VMware (s vmw) wants a piece of that pie. On Tuesday the company plans to open up the public beta program for its vCenter Log Insight program for analyzing unstructured machine-generated log files before the software becomes generally available in the third quarter of the year. 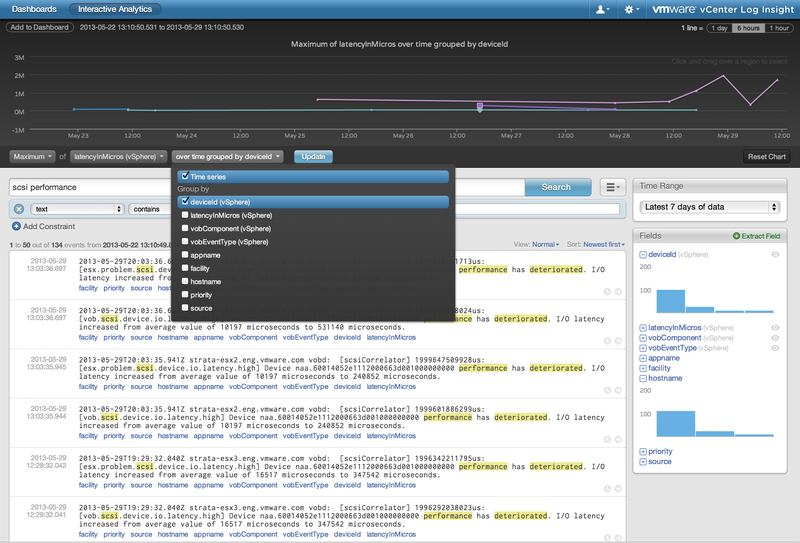 The product fits in next to VMware’s vCenter Operations Management Suite, which can analyze structured time-series data. Initially, the product is targeted at helping customers troubleshoot errors and identify the root causes of technical issues, said Mahesh Kumar, director of enterprise management marketing at VMware. Later on, based on user feedback the company could tweak the product to tailor it to use cases around security and compliance, he said. The product rollout comes following VMware’s 2012 acquisition of the Log Insight product and employees from startup Pattern Insight. Private beta testing got underway late last year. The product will compete with plenty of log-management options currently available. In addition to Splunk, there’s Loggly (see disclosure), Papertrail and Sumo Logic, and open-source options such as logstash are also available. Then there’s Chronon, a startup seeking to replace log files with a record-and-replay process. Kumar believes the VMware offering stands out for its ease of use through a simple interface and its pricing model. Rather than charge by volume of data being indexed, Log Insight customers pay $200 per data source, he said. That means customers don’t have to worry about over-provisioning or under-provisioning without knowing what they will need. While VMware keeps adding to its software lineup — the NSX network-virtualization software courtesy of the $1.26 billion Nicira acquisition is also on the way — the company is also preparing to make its public cloud available. These initiatives and other attempts to carry out on the software-defined data center vision will be on the table for discussion when Om sits down with VMware CEO Pat Gelsinger at our Structure conference on June 19. Disclosure: Loggly is backed by True Ventures, a venture capital firm that is an investor in the parent company of GigaOM/paidContent. Om Malik, founder of GigaOM, is also a venture partner at True. IBM has a competing product Smartcloud Log Analytics, which is out of beta and available for sale from 6/14/2013. That’s rich. VMware is going to be struggling for quite some time in their space. Why go after Splunk who is years ahead of them with logging, big-data?